Have you ever thought about becoming an event planner? You have to be detail oriented, organized, and passionate about events. If this is you, I recommend reading How to Start a Home-Based Event Planning Business. Jill Moran breaks down the different types of events, and how to be the best at each one. She also gives examples of invoices, spreadsheet layouts, time lines, and much more. This is an easy read that does not sugar coat the business of event planning. Moran tells it to you straight on how to be a successful event planner. 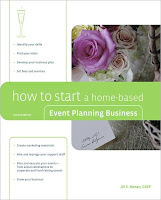 So check out a copy of this book before you take the first step to becoming a work from home event planner.